John Workman (left), distribution line coordinator, and Roger Blankenship (center), IT field manager, volunteered to help with the “Power up the Pantry” fundraiser. Kathleen Cowan, daughter of Dan Cowan, customer services engineer, made an appearance as Louie the Lightning Bug. Appalachian Power Company and its employees helped generate nearly one ton of food and more than $5,000 for needy families in the Kanawha Valley during a recent “Power up the Pantry” fundraiser in Charleston. The non-perishable food, cleaning supplies, baby items, cash and other items benefit the Mountain Mission food pantry. 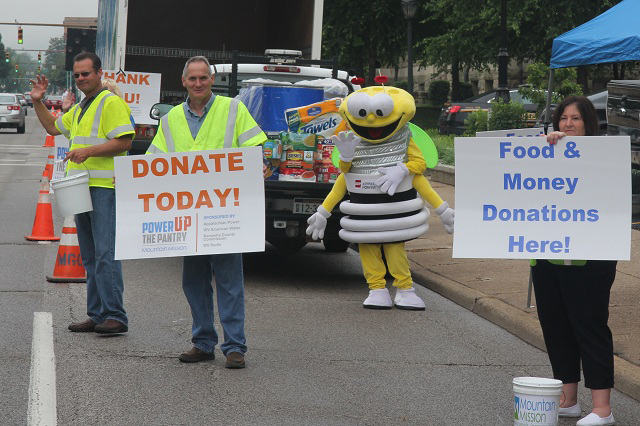 Appalachian Power started the “Power up the Pantry” event last year in response to the June 29 derecho storm that left area food banks with a critical shortage of food and supplies. This year’s food drive was held in partnership with the Kanawha County Commission, WV Radio and WV American Water. The organizations decided to partner to make the largest possible community impact. The food pantry received more than $3,400 in donations along with a separate $2,000 donation from Appalachian Power. “A number of very dedicated Appalachian Power employees gave their time to help. Not only did we have a fantastic result, but we had a lot of fun,” said Jeri Matheney, corporate communications director. In addition to the “Power up the Pantry” one-day event, Appalachian Power employees collected food for a month at the North Charleston Service Center, Amos Plant, Hurricane Customer Operations Center and Appalachian Power headquarters building to benefit the Mountain Mission organization.